Mount Proust, as seen on a midwestern Saturday afternoon. I'm climbing In the Shadow of Young Girls in Flower and have made it to the top of the P of Proust. Since Proust died in 1922, only those four volumes first published during his lifetime had passed into the American public domain by the time the Bono Act became law. It will therefore be at least 2018 before readers in the United States can find the final three installments of the new translation . . . in their local bookstores. There is some good news: the final three volumes are available in the States, at least for now, from Amazon, in two British Penguin paperbacks (which can be found here and here). My copies took about a month to arrive, and I don't think I've ever been happier to have books in my hands. 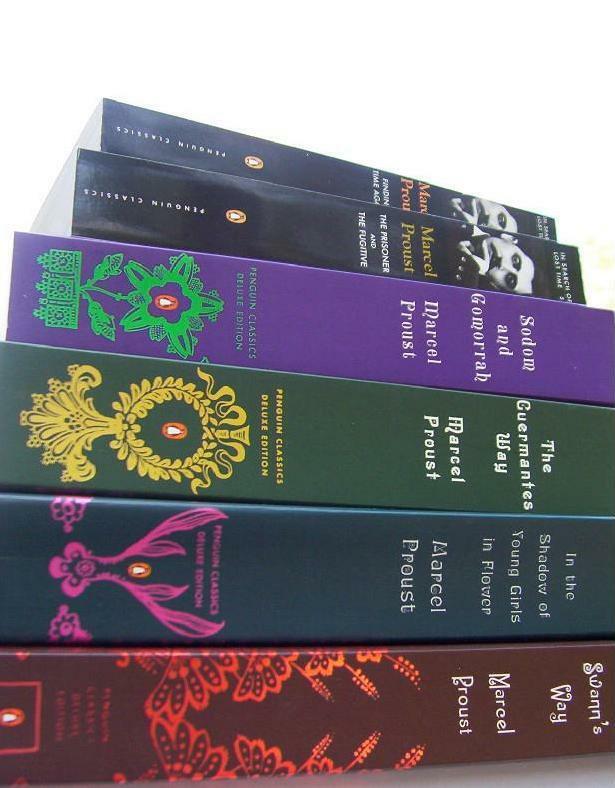 If I were interested in reading Proust in the Penguin edition, I'd order these now. Iranian President Mahmoud Ahmadinejad has ordered government and cultural bodies to use modified Persian words to replace foreign words that have crept into the language, such as "pizzas[,]" which will now be known as "elastic loaves," state media reported Saturday. "No, she threw a dart at the mouse and killed it." The study found that students in the program performed better in six categories of literacy and critical thinking skills — including thorough description, hypothesizing and reasoning — than did students who were not in the program. . . .
Robert Frost once said of Sandburg, they were apparently to give a poetry reading together and someone said, "Where's Carl?" and Frost said, "He's upstairs messing up his hair." "Sometimes I feel too full of myself," I say. And I, "Sometimes I'm so happy I can't stand myself." how little good my health did anyone near me." When I was an undergraduate, one of my professors told a story of seeing Frost backstage before a campus reading. Unhappy with the reading arrangements, Frost was kicking a student. I would not be surprised if that which lies ahead for classical modes of reading resembles the monasticism from which those modes sprung. I sometimes dream of houses of reading — a Hebrew phrase — in which those passionate to learn how to read well would find the necessary guidance, silence, and complicity of disciplined companionship. . . . The tale is told of how Erasmus, walking home on a foul night, glimpsed a tiny fragment of print in the mire. He bent down, seized upon it and lifted it to a flickering light with a cry of thankful joy. Here was a miracle. A return of that sense of the miraculous in the face of a demanding text would not be altogether a bad thing. A "sense of the miraculous in the face of a demanding text": what every teacher of literature should aim to inspire in the residents of her or his house of reading. The company website doesn't say. (Other fast-food companies offer detailed information on ingredients.) An online search yielded no clear answer. After calling Jimmy John's corporate office and sending two e-mails, I finally got an answer. Jimmy John's bread is not vegan. I offer that information here for anyone else who's wondering. The time we have to spend each day is elastic: it is stretched by the passions we feel; it is shrunk by those we inspire; and all of it is filled by habit. According to his friend Ralph Waldo Emerson, Thoreau seems always to have carried, "in his pocket, his diary and pencil." So why did Thoreau — who had worked with his father to produce the very best lead pencils manufactured in America in the 1840s — neglect to list even one among the essential things to take on an excursion? Perhaps the very object with which he may have been drafting his list was too close to him, too familiar a part of his own everyday outfit, too integral a part of his livelihood, too common a thing for him to think to mention. 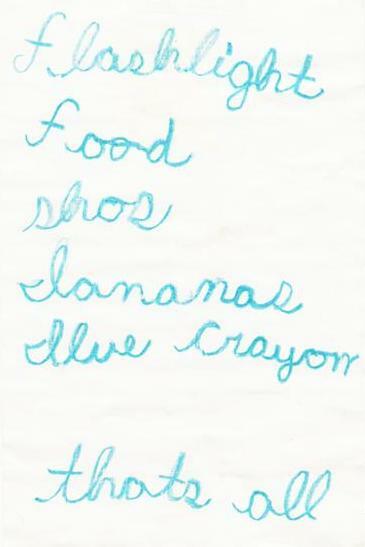 When my daughter Rachel made a list of supplies for an imaginary camping trip (at the age of six or seven, I think), she was careful to include the blue crayon with which she wrote her list. This list has been on a wall in my office for many years; I thought it would be fun to scan it and post it here. The list now appears in Sasha Cagen's anthology To-Do List: From Buying Milk to Finding a Soul Mate, What Our Lists Reveal About Us (New York: Touchstone, 2007). And each new teller adds to what he hears. Sounds remarkably like a white-collar workplace. As a teenager, Florence Wolfson kept a five-year diary from 1929 to 1934. She and her diary were recently reunited. The curmudgeons of this world know that every new operating system brings with it at least much hype as benefits, and more often than not means spending lots of money in pursuit of the ever-elusive goal of making life at the keyboard perfect. And so they'd rather fight than switch. From an artlcle on why it might be smart to stick with Windows XP and avoid Windows Vista. These richly textured pieces of genuine lizard will endure years of use. Inside are pockets of genuine calfskin. Just how many mad scientists are now working for Levenger anyway? 42% of U.S. college graduates never read another book. 58% of the U.S. adult population never reads another book after high school. 81% of the U.S. population feels "they have a book inside them." 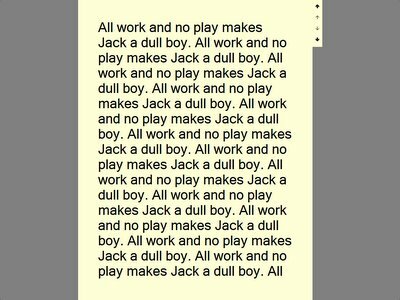 What makes Dark Room different from a text-editor: the full-screen mode removes access to the desktop, so that there's nothing but a blank "page" — no titlebar, no taskbar, nothing to pull you away from writing. And full-screen mode keeps the "page" in the middle of the screen (very different from writing in a text-editor with a maximized window, with text running the width of the screen). DarkRoom's defaults are old school — green text with a black page and black background, but colors and margin settings (along with font style and size) can be changed to your liking. And you can toggle between fullscreen mode and a smaller, conventional window with F11. I love the idea of a computer program emulating a typewriter (the Mac program Blockwriter, in development, goes further, removing cut and paste.) 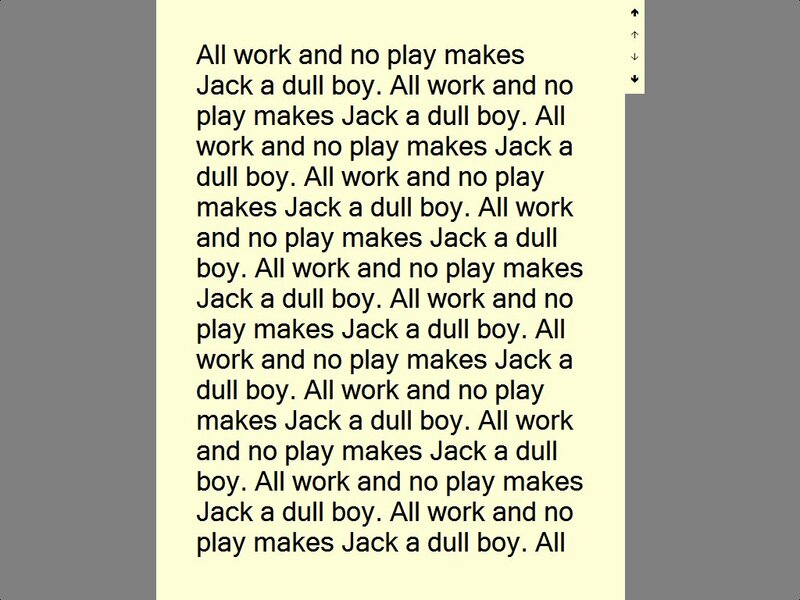 And I find it interesting that as Microsoft Office is on the verge of becoming even more visually complicated, people are creating alternatives for writing that function with extreme simplicity. » My version of "Amish computing"
All your needs in one place: hair, sportswear, and martial-arts instruction. A while ago I installed Ubuntu on an old laptop (thereby bringing an antique back to life). This past weekend, I wiped out Windows XP and installed Ubuntu on our family desktop computer. So with five computers in our family, the score is now Windows XP 3, Ubuntu 2. Our absolute reliance on Windows has come to an end. The care and feeding of our family's computers has always fallen to me, and over the past six or seven years I've reinstalled Windows 98 and XP on various computers at least six or seven times. No matter how careful we are, problems, mysterious, impossible ones, appear. That's what happened this past weekend — bewildering freezes that could only be undone by disabling our wireless connection. Our arsenal of anti-malware, anti-spyware, and anti-virus programs could find nothing wrong; restoring the system with ERUNT was no help. The only way to resolve this problem was to reinstall Windows. That would have meant getting all of SP2 (an endless download), patching XP to allow a custom theme, reinstalling dozens of programs, tweaking all sorts of settings — in short, giving up a day or more to bring the computer back from the dead. And for what? I'd likely be doing it all again a year or so from now. So with my family's blessing, I went for Ubuntu. 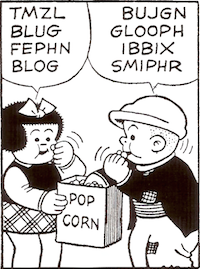 Switching was simple. Wiping the hard drive and installing Ubuntu (from one CD) took about thirty minutes. (The installation includes Firefox, the GIMP, OpenOffice.org, and other programs.) As with the old laptop, establishing the wireless connection was a simple matter, and the system recognized and installed our printer in less than fifteen seconds. Updating Ubuntu and adding some programs from online "repositories" was quite straightforward and also took very little time. Is everything perfect? No. The major problem thus far is that Suspend and Hibernate don't work, so all we can do is leave the computer running or shut it off. Ubuntu starts up and shuts down very quickly, so even this problem doesn't seem crucial. (It's widespread, so I hope that it will be solved with an update). I miss the backup service Mozy, though the Firefox extension Gmail Space gives us free online storage via a Gmail account (alas without automation). I'd like to have a program similar to AllChars, so that I can add em dashes in text files and type, say, /link and have the appropriate HTML for a link appear. (I would think that such a program must exist, but I haven't found it.) And there are various small issues that should get resolved as I learn more about Ubuntu. There is, yes, a learning curve, at least for the person who's maintaining the computer. I need to learn, for instance, about the advantages or disadvantages of partitioning our hard drive (I know how to partition; I just don't know whether it's appropriate to do so). The Ubuntu forums, easily searched, have already provided answers for many questions. I suspect that as everyday computer users think carefully about the costs and complications of "upgrading" to Windows Vista and Office 2007 (both hideous, from the many screenshots I've seen), Ubuntu will become increasingly popular. I'd go so far as to predict a near-future in which many households are running at least one computer with a free operating system. It's relatively easy to jump out of Windows and land on your feet. Our town pool has been renamed an "aquatic center." But that doesn't mean that we will be swimming with sharks. 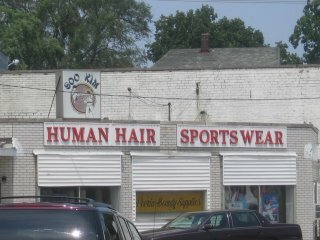 According to our local newspaper, the change of name is meant to show that there's more to the pool than a pool. There is also a water-slide. I would not like a piece of "funeral pie,"
you can tell, I know, no more.